Craft and Carry Tote by Stampin’ Up! Hey Stampers! Stampin' Up! is always coming up with ways to make our starter kit better. I've got to tell you, the $99 price is already an incredible value. How many other businesses could you start for $99 and get pretty much everything you need to begin a profitable business? But, during our Sale-A-Bration months, January through March, the opportunity gets even better! You can choose the starter kit option that gets you this tote AND an extra $50 in products…WOW! Take a peek at this short video to see all the features of this amazing tote! You know, I started my paper crafting business over 16 years ago and have never looked back. The flexibility, virtually no overhead, and the profitability model that Stampin' Up! offers, truly is worth a look. We all love our Big Shot Magnetic Platform! It does away with the need for those pesky post-it notes when using Framelits. BUT, this tool can be easily ruined by cutting directly on the platform, so here is a tip to protect your tool investment. Tape a Standard Cutting Pad (113475) on top of the Magnetic Platform using a piece of Masking, Duct/”Duck” Tape or Painter's Tape, in each of the corners. Then, when you want to cut cardstock using a framelit, you'll be all set to go and you won't inadvertently cut directly on the platform. My second tip today also involves your Big Shot. Once in awhile, when I cut a piece of card stock with an intricate Sizzlit (i.e Delicate Doilies – 126999), little pieces of card stock remain stuck in the die-cut piece. There is an easy way to prevent this from happening, using an item we all have in our kitchen! Layer a piece of waxed paper between the card stock and the die, and the pieces should pop right out. Leave me a comment if either of these tips are helpful to you. Catch ya tomorrow! Hope you enjoyed my last fancy fold video on the tri-fold shutter technique and I'm excited to share this week's technique. On this video I'll be teaching you how to make this fun fold that will work for any occasion to amaze your family and friends. After you've watched the video, come back and I'll give you a supply list, measurements, and instructions to finish my card. Instructions: Cut all cardstock using above dimensions. Using Early Espresso Ink, stamp Swallowtail image onto smallest Crisp Cantelope cardstock piece. Using SNAIL, adhere this to the 3 1/2 x 3 1/2″ Early Espresso piece. Adhere largest Crisp Cantelope piece to card base and then adhere stamped image piece to card base. Run Very Vanilla Core'dinations piece through Big Shot using scalloped edge Embossing Folder from Delicate Designs set. Using Sanding Block, sand off some of the cardstock until the white inside core shows through. 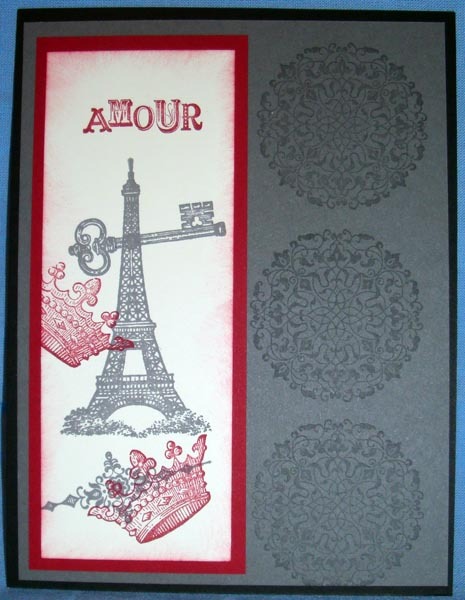 Using Stampin' Sponge and Crisp Cantelope Ink, sponge as desired. Sand off a bit of sponged part so you will see more white showing through. When you're satisfied with the look, adhere to right edge of cardstock. (once all the pieces are attached to the front, you will have an edge of Early Espresso showing all around the card front). Cut a piece of 4 -1/2″ Early Espresso ribbon, put SNAIL on the back, adhere to front of card and snip off edges. (you can also cut a sliver of Early Espresso Cardstock to use in place of the ribbon if you don't have the right color). Using scrap piece of Early Espresso Cardstock, punch out small scallop. Cut small piece of Cantelope Crisp ribbon. 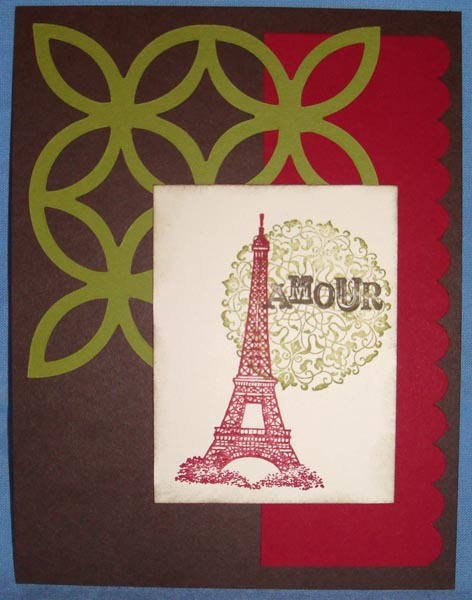 Put one Stampin' Dimensional on back of scallop circle and place on front of card. Using SNAIL, adhere ribbon to top of circle. Put two Glue Dots on back of button and place on top of ribbon. I think anyone will be “wow'd” when receiving your card. 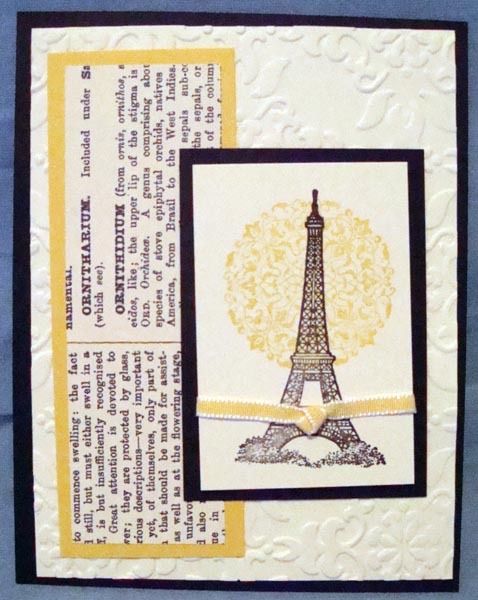 This card would also be lovely using the large Sunflower Stamp (c-123608, w-128736). If you create a card using this fancy fold technique, please email a picture…you might become my next guest blogger! Send a card to a friend just to say "Hello!" and post a comment below when you've sent it. 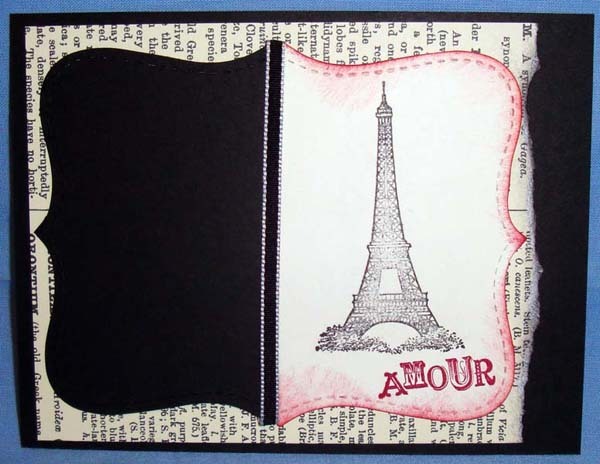 "Your scrapbooking layouts can make all the difference in how your pages look. The key is to have many scrapbook sketches available already there for you to choose from and to help you get over those times when your own creative ideas are at a standstill." "I have discovered in my own scrapbooking sessions that if I have a sketch to go by, the hard part is already done." And …"do not forget the journal box on your pages." It's a good article. I think my favorite line was, "Always remember, enjoy your hobby and don't feel as if it is another job." Please leave me a comment if you find articles like this helpful. If you like them, I'll keep linking to them from time to time. I have customers from time to time who say, "I'm just not creative…" or "Gosh, look at the work that So-And-So does. Her cards are always so _____ (you fill in the blank), compared to mine." I can identify pretty readily with those people because I often felt that way myself when I was just getting started with stamping, scrapbooking, and paper crafting. Heck, when I see the things that y'all do now, sometimes I STILL get that feeling! Here are a few simple examples that I made with the Artistic Etchings Stamp Set, (118517-wood, 120573-clear). Please click on each 'thumbnail' image to see a full-size version. Dave is experimenting with this method of showing pictures to see if people like it better. It's a little more work, but seems worth it as it usually will allow you to see a significantly larger picture. Please leave a comment with your opinion. Like it? Hate it? We'd like to know what you think.